CupCakeBite is an adorable cafe-style bakery that gave us our cupcakes (literally) on a silver platter. I couldn’t decide between the Blondie and the flavor of the week, so I decided we had to split them both. 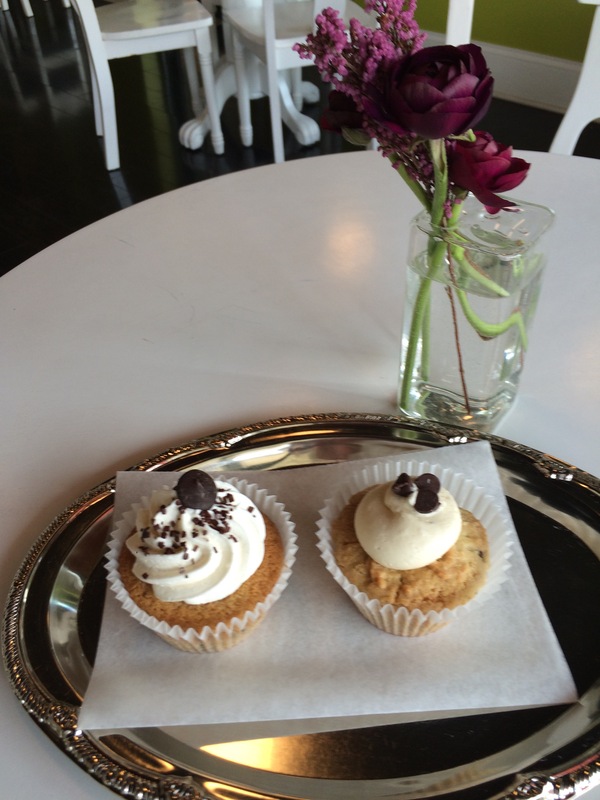 The Blondie was an awesome combination of cookie and cupcake. The texture was a lot like a traditional blondie with a bit more softness. I also associate walnuts with blondies, but this had only chocolate chips. And of course it had icing, as every worthy cupcake does. There is a “sweet spot” (sorry for the pun) when it comes to icing. It needs to be a complement for the cake without overwhelming, which is not as easy as it sounds. So many cupcake shops fall into the twin traps of too much and too sweet. The Blondie does well on sweetness – the brown sugar buttercream is delicious and well-balanced. However, there could have been more of it. I think that a cupcake should have enough icing to get some in each bite, and the Blondie failed. The Blondie is the cupcake on the right, so you can see that there’s only a small dollop. When we were done stuffing our faces with cupcakes, we worked off some of the calories by walking the mile and a half to Stick Boy Bakery. After some deliberation, Ashley chose the St. Patrick’s Day themed Irish Cream Cheesecake and I decided on a walnut raisin sticky bun. I also got a quick lesson on the difference between a cinnamon bun and a sticky bun, since Stick Boy has both. Sticky buns are also on my list of things to bake! I left the cheesecake to Ashley except for one bite, but it was a wonderful bite! When I told the husband about it later, he was sad that the Irish Cream cheesecake didn’t have booze in it (I don’t think), but I don’t think he would have been disappointed by the taste. 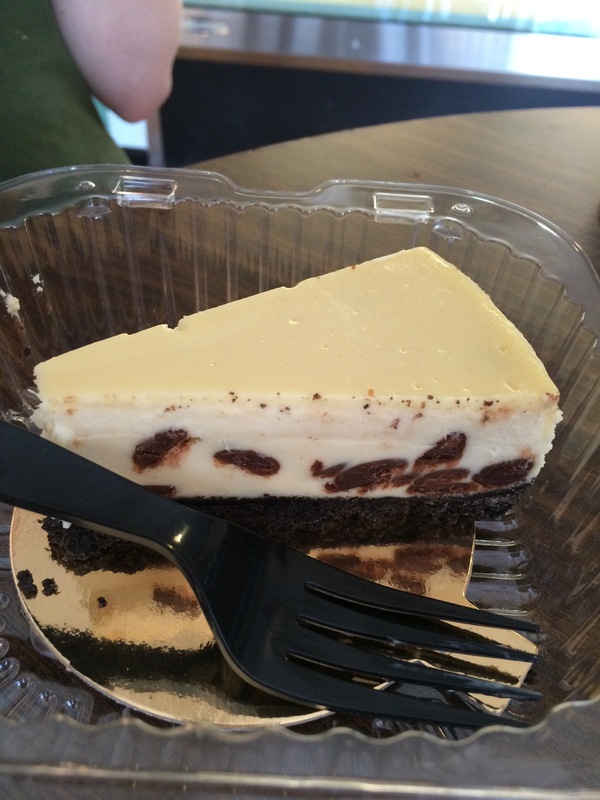 “Cookies and Cream” would probably be a more accurate name, since it had a chocolate crust and bits of chocolate cookie inside, and the texture was wonderfully creamy, like a good cheesecake should be. 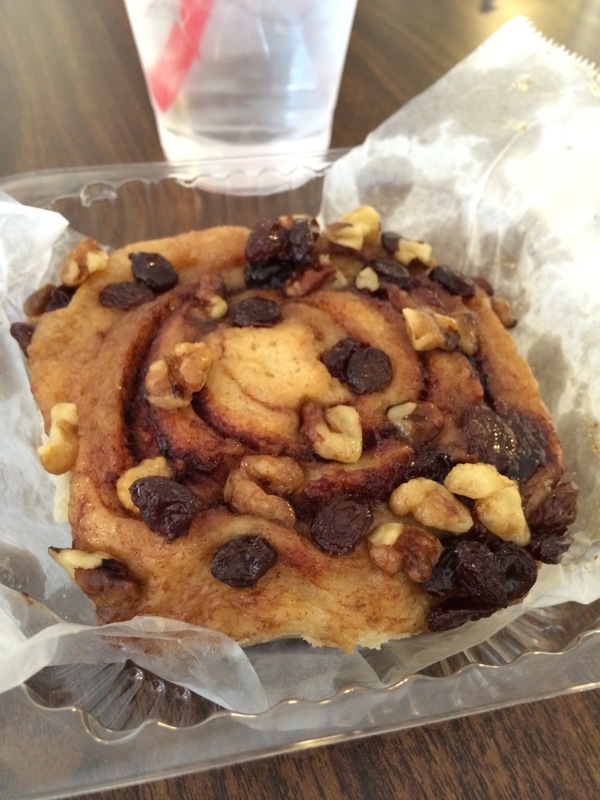 I only managed a few bites of the sticky bun before saving the rest for the next day’s breakfast, but it was difficult to put it down! My only critique is that I would have loved if there were walnuts inside the spirals of the bun in addition to stuck on the outside. Some of my nuts fell off my bun and I couldn’t eat them, which is a terrible waste. I would also replace the raisins with more nuts, but that’s obviously a personal preference. To round out my bakery experience, I also brought home a ball of pizza dough, which I made for dinner the following night. It’s hard to do a review of this, since the outcome of my pizza had as much to do with me as it did the dough. I admit that I need more practice when it comes to pizza-making, but this was the best one I’ve made so far! Doesn’t that look delicious? It was! It was four cheese – mozzarella with a blend of asiago, parmesan and fontina. I spread some cornmeal on my pizza stone and worked the dough into an approximate 10-inch circle. I pre-baked the dough for 7 minutes, although I think I could have left it a minute or two longer. 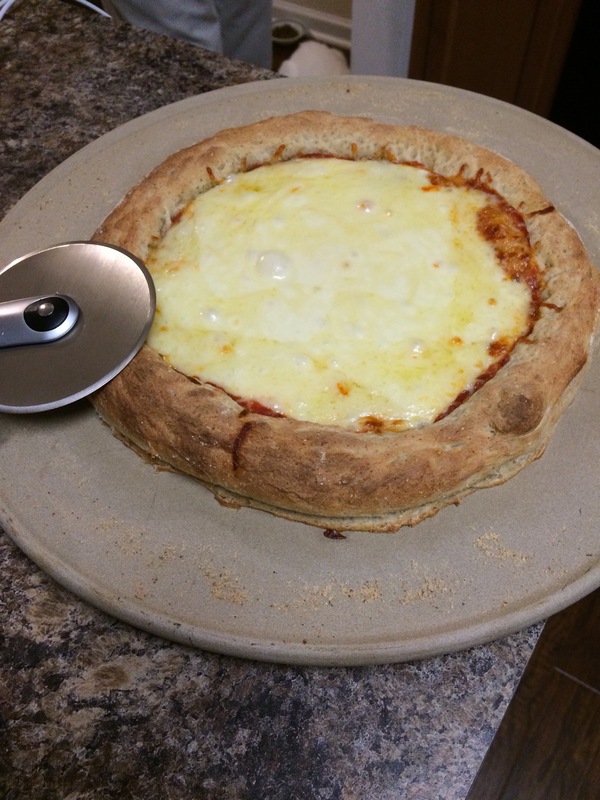 The crust puffed up nicely, but the part under the sauce and cheese stayed relatively soft and chewy. That’s what makes me think I could have pre-baked longer, but we liked it anyway! There it is – my first NC bakery tour! Where should I go next?